The ROM Dance is a safe and easy to learn exercise that you can practice at home or with a group. Simply purchase the ROM Dance® Home Practice Kit and follow along with the DVD as a daily routine. Once you are familiar with the movements, you can play the ROM Dance® verse and music CD to accompany your movements. Or, learn the verse and the movements, then flow with ROM Dance® Reflections and Currents music. Home Health and Long-term care facilities purchase the ROM Dance® Professional Media Kit, to learn and lead it for individual and group practice, or play the DVD for residents to follow. 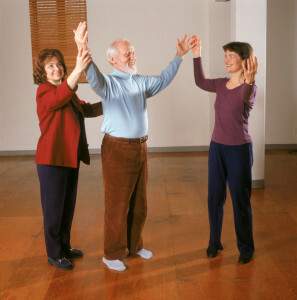 The ROM Dance is introduced at all the Tai Chi Fundamentals® Level One-Two Professional Training Courses.